It’s a weirdly bittersweet thing that indie games have become so prevalent as of late. On one hand, there are a lot of really good games out there from unknown developers that manage to accomplish many things that triple-A titles can’t. On the other hand, however, the market often becomes saturated, and finding the best games becomes a challenge. But it’s still a nice thing to hear about a “Kickstarter Success Story,” a game funded by fans, and when it was time for the developers to deliver, they did in full. And while these are tragically rare, the few that made it stand high above the rest. 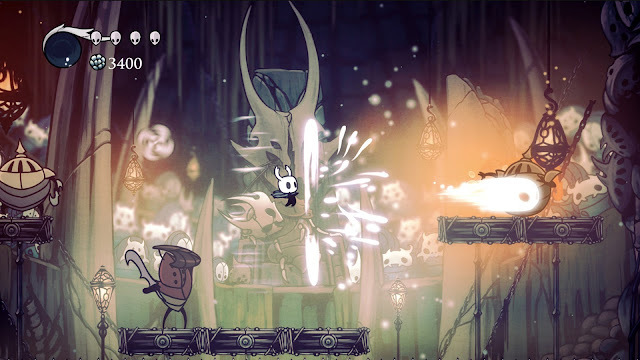 One such one of these games is a quirky Metroidvania-styled title called Hollow Knight, created by Australian indie developer Team Cherry. Originally released on PC in early 2017, the game was recently ported to the Nintendo Switch. Since the game’s 4th free DLC package, Godmaster, is releasing in only a few days, the time seemed right to delve into whether this game is as hollow as the title implies. With only a short opening cutscene and a very hands-off tutorial, Hollow Knight is quick to throw you into the action. 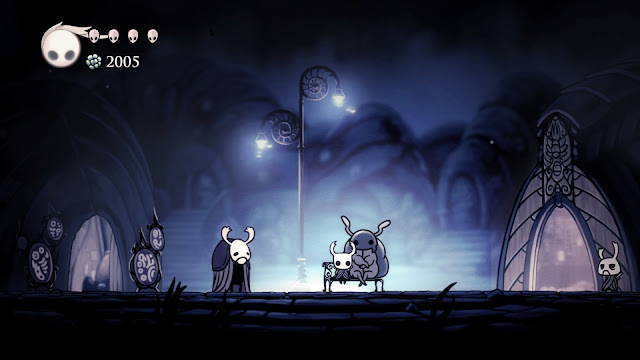 The game sees you take the role of a small silent anthropomorphic bug person, referred to sometimes as “The Knight” or “Little Ghost.” Drawn to the ruins of the fallen subterranean kingdom of Hallownest by an unknown motive, the world is yours to explore as you interact with other anthropomorphic bug people and uncover the mysteries of the kingdom. And that’s about it. That’s all you’re really given. You know that this supposedly eternal kingdom fell, and that there’s some kind of plague ravaging the caverns, but the game doesn’t give you much more than that on the surface. 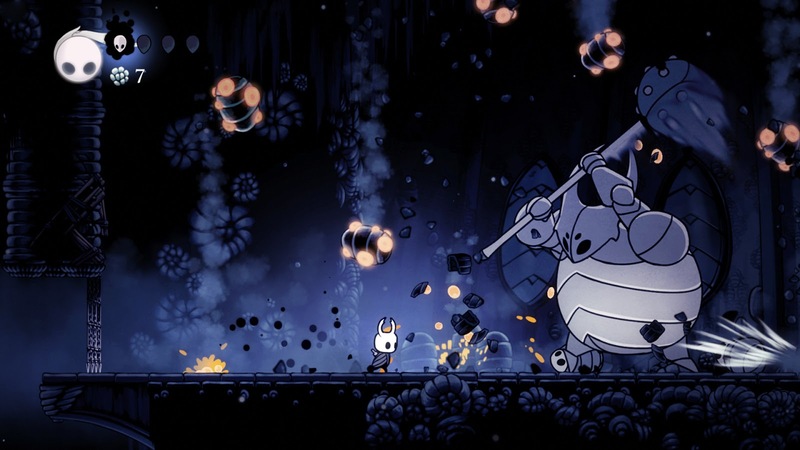 Hollow Knight uses a startlingly minimalist storytelling approach, similar to games such as Dark Souls or Metroid Prime, where if you want the story and the lore, you need to go out of your way to look for it. And like those games, there is definitely a lot to uncover. The story, when properly uncovered, is a rather intriguing tale of desperation, sacrifice, and futility that I will not be delving into to avoid spoilers, but I will say that even having completed the game, there’s still things I don’t know. The lore forces you to make assumptions and guess a lot to make sense of everything. Whether this will be rectified in future DLC, only Team Cherry knows. Hollow Knight has three different endings, and an unlockable post-credit scene. 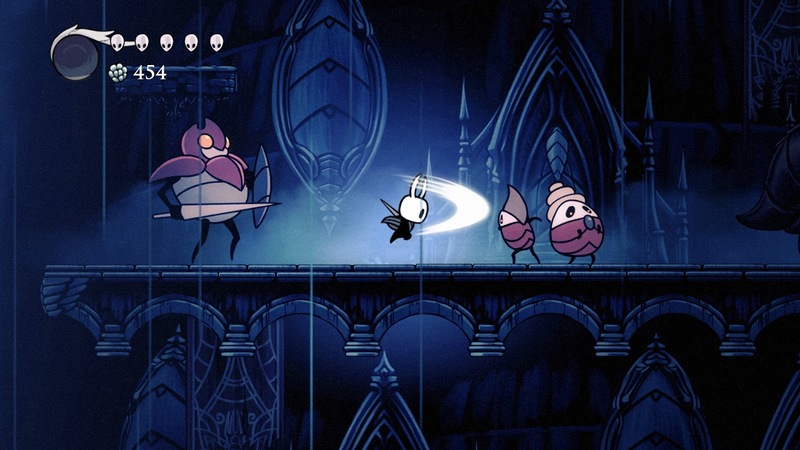 Hollow Knight is a tried and true Metroidvania game, meaning it’s a 2D-Action-Platformer with an emphasis on exploration, backtracking, and collecting upgrades. Like most Metroidvanias, you start out with only a handful of tools in your arsenal, and gradually gain more to explore and fight with. The game’s movement is surprisingly weighty, but nothing impossible to get used to. Combat is primarily melee, though there are several ranged attacks you can gain access to through the use of “Soul Energy,” that you gain more of every time you strike an enemy. This Soul Energy can also be used to heal your surprisingly small health bar, and use certain special attacks. Combat is fluid and never feels like it slows down the gameplay, often boss battles see you moving all across the battlefield to evade enemy attacks, and with somewhere around, and with somewhere around 30 equippable charms to augment playstyles, there is plenty of room for customization. Exploration is a major aspect of the game, as new areas will lead to new upgrades will lead to new story aspects and there’s strikingly little structure to it. Once you clear the first couple areas in Hallownest, the map really opens up in almost its entirety. And that’s another aspect: mapping. In order to get a map of each of the game’s areas, you must first find a cartographer character in the area and buy the map off of him. These maps are generally incomplete however, so as you explore the caverns, you must add to the map and improve upon them. As for the platforming, it’s evident that it was never the priority in the game. Platforming challenges are few and far between, but the game’s weighty movement and aerial momentum makes them somewhat challenging for untrained players. Unfortunately, an area near the ending of the game is almost entirely filled with these platforming challenges, and can be a little infuriating to play through. At least it’s only a small portion of the gameplay. Hollow Knight uses a completely hand-drawn art style. Its characters, even as cartoony as they can look, are well-designed and feel right at home in the game’s environments, which are generally bleak and cavernous or look like they were directly inspired by H.R. Giger. Each of the game’s areas is primarily monochromatic, meaning the important details really stand out, and the action in the foreground is always the focal point. Each area is distinct, with different elements of gameplay, level design, and art. The world really does a good job at feeling like a fallen kingdom. Most of the music you’ll hear in Hollow Knight is soft ambiance to compliment an area. The music fits each area rather well, and when an area decides to do away with the music for, say, the constant scratching sounds of something moving though the tunnels, you’ll definitely notice it. Contrast to this are the more melodic pieces that play in more story-relevant areas or the intense boss themes. Composer Christopher Larkin does a fantastic job at conveying mood and tension through these pieces, and while no songs really exceptionally stand out, none get lost in the crowd either. Hollow Knight really doesn’t have much in way of sidequests to pad the main story out, but it does have a lot of little details that make the world feel more complete. There are achievements though, and many of them can’t be accomplished in one run. The game’s three endings are all just part of the story, and the unlockable post-credit scene is reward for one of the game’s few sidequests. In addition to the main game, Team Cherry has released DLC. So far there have been three free DLC packs: Hidden Dreams, which adds two new optional challenge bosses and a new means of fast-travel; The Grim Troupe, which adds a new quest line, two new bosses, and several new charms; and Lifeblood, which adds a new boss, tweaks another, and adds a plethora of gameplay, graphical, and technical updates. Releasing August 23rd is Godmaster, a 4th free DLC pack that includes a new boss arena among other things, and a 5th DLC featuring a new playable character has been announced, though nothing else about it is known. If you’re looking for a game with a good challenge, with fun combat and an intriguing story, Hollow Knight is your game. If you like more straightforward stories and linear paths, maybe try something else. Hollow Knight delivers in strides in terms of content, with an enormous amount to do and find, and secrets around every corner. While certain gameplay aspects may feel infuriating at times, especially a certain platforming segment at the game’s end; the fluid combat and depth of the story certainly help to make it better. 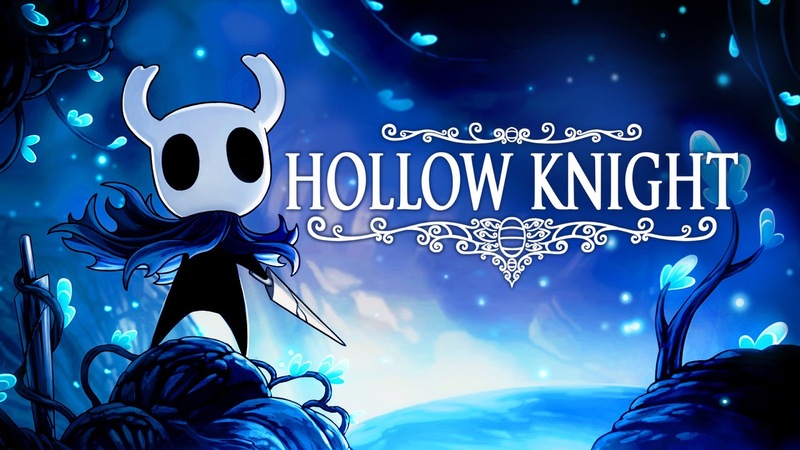 Overall, I would recommend Hollow Knight to any Metroidvania or Dark Souls fan looking for a new take on their familiar genres.